The answer: the top one is the AliExpress one, and the bottom one is the Nars! Let me start off this comparison by saying that I’m not a big fan of Nars brushes in general. I find the goat hairs they use to be really scratchy – don’t just take my word for it, I encourage you to test out a Nars brush at the counter and don’t just touch it with your hands, test it on your face – it’s downright rough. I also find their brushes to shed excessively. I understand that they will shed due to the natural hairs but the brushes seem to continue to shed even after years of use and multiple washings. 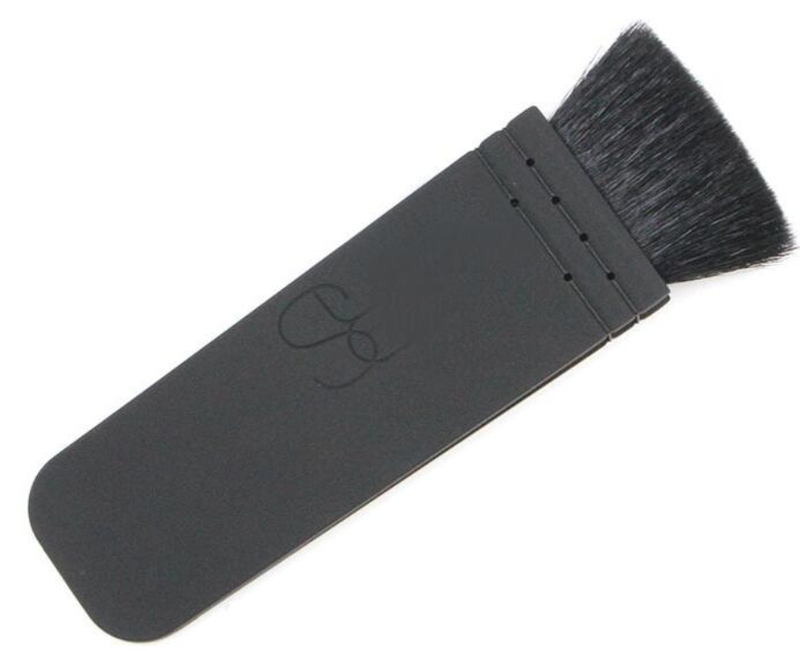 Yes, this is the real Nars brush – can you see how wiry the hairs are? And here’s the thing, the Nars Ita brush is made in China! How do they justify charging that much for a brush made with cheap labour, and what I consider to be inferior materials? Do you know how this brush is made? I inspected it closely and it’s essentially a bunch of black dyed goat hairs bundled together with what appears to be duct tape at the base, then sandwiched between a plastic handle, and a polyester cording is woven through to secure the bristles to the handle. I guess that’s what they call an artisan brush these days. Now, onto the AliExpress brush. Please note: I bought this brush knowing full well that it wasn’t the real Nars brush. I got it to see how a $2.74 brush would compare to the $70 one. Those of you who are thinking they can get a “deal” on the real thing from AliExpress – they’re all fakes on that site! On the surface, the AliExpress brush looks identical to the Nars brush – the handles look so similar that when I first received it, I put a hair elastic around the Nars one so I wouldn’t confuse the two. Now that I’ve used both and inspected them closely, I can tell the minute differences straight away. And the hairs are much MUCH softer compared to the Nars or AliExpress! PS. I will be doing a review and swatches of the NYX palette soon, I promise! The Anna Sui Face Brush deposited the powder much more evenly and softly than either the Nars or the AliExpress brush. The Nars one does diffuse the colour but I found it deposited the colour unevenly. The AliExpress was the most narrow and deposited the heaviest swatch. But honestly, you’re better off buying the $2.74 knock-off brush than paying 25x more for the real thing since I cannot in good conscience recommend the Nars brush. 😛 Actually, go get the Anna Sui instead! 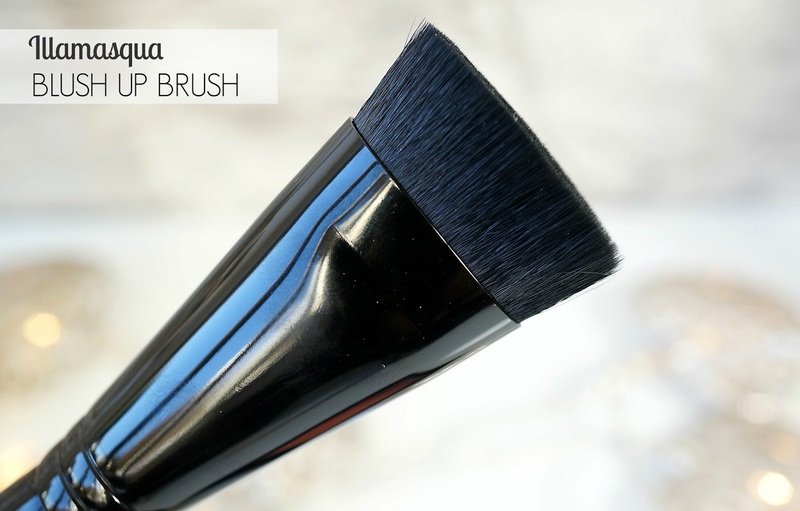 Are you still thinking of getting the Nars Kabuki Ita brush? Would you get the cheaper alternative? What’s your favourite brush for contouring? It’s crazy ali express is allowed to make something with the Nars label and everything! Great review. Really detailed! It is pretty crazy that they sell it with the Nars logo on it! I could understand if the handle was blank but everything else the same. I guess Nars really has no way to go after these people. That blows my mind too. That’s how so many people end up getting ripped off! Yeah if someone is selling the Nars brush for less than $5 claiming it’s real – RUN. There’ no such thing as a deal that’s too good to be true. I haven’t tried the Real Techniques contour brush – I bet it’s super soft! Yes, I often use a small rounded brush to contour too – works well for my temples and hair line areas! I’ve seen nothing but bad reviews of the Ita brush. I don’t get why some love it. Felt so scratchy to me. I like the brush that came with my Lorac contour palette. It’s soft and works well. It gives a nice precise contour but blends out nicely! Glad I’m not alone in thinking how rough the Nars brush is – ick. The Elf contour brush is nice too. Only $6 US. The Anna Sui brush is so beautiful. It is as soft as the little cheek one that I have? The cheek one you have is actually softer! 🙂 But this one is quite soft too. Yeah in this day and age, why are companies still making scratchy brushes? I don’t get it! Yes, our delicate faces can’t handle rough brushes – it’s like using a brush meant for a horse! Lol 😂 shame poor NARS. The price of the NARS brush is ridiculous compared with the make of the AliExpress brush. Wow. And yeah, prices going up like crazy. Guess they just don’t want us to buy anything, anymore! It does make me wonder if those handles came from the same factory as rejects? Nars is really pricing me out of consideration of the brand. I’ve been wanting to try more things from them like foundation and lipsticks but I just don’t put Nars on the same level as Chanel / YSL and the prices aren’t getting too far off! Wow, that brush looks horrible, and you have two of them now! Lol. How could Nars charge so much money for a flimsy brush like that?! And I thought they were cruelty free? The Anna Sui brush looks divine though 😍. I know, I was thinking, what the heck am I going to do with 2 of these brushes now? 😛 They’ll probably get purged! Anna Sui brushes are so underrated – I think because the handles are plastic and they look so childish – but they’re really good quality! Lol, at least you only paid $3 for the other one. I’ll have to look into her brushes, I think her brushes look cute yet elegant, but everyone sees things in a different light. Not sure what qualifies as cruelty free anymore when it comes to items made in China. I know they mandate testing if sold there but if made there and not sold there it’s ok. I dunno! I just never thought using goat hair would be a good for a makeup brush. Has Nars seen goat hair?! Very coarse and wiry 😖. Plus, shame on them for stating they are cruelty free if they are using animal hair for their brushes. No bueno. I know that Wayne Goss uses real animal hair in his brushes and they’re considered cruelty free. I think the method in which the hairs are collected is humane. Yes, you’re right with this one. Lots of products are made in China – but as long as they’re not sold there, they won’t undergo testing. Yey! 🙆 I think I guessed it right for your twitter pic. I want to learn all there is to know about how brushes are made! I’ve been watching some videos online – very interesting. Just makes me appreciate the mass produced vs the artisanal brushes. Yeah the rubbery finish also doesn’t fare well over time. I have some older Smashbox compacts and the rubbery finish feels gummy now. It’s crazy how much these two look alike (hehe I thought the top one was the NARS and the bottom one was the Ita!) If they look and generally perform the same, why not just cheap out and get the AliExpress one? And for sure, if anyone is hellbent on getting this style of brush, go for the knock off, honestly! What’s wrong with the NARS Yachiyo? It looks like it would be a really good brush! It’s rough and sheds like a mofo! It’s so flimsy. wow, that’s bad! I see that it also retails for $70 CAD…oh hells no. I don’t bother with Nars brushes anymore. Such a shame. I think Anna Sui brushes are so underrated! I know it’s slightly more difficult to get but I think they’re worth seeking out! and such quirky packaging too! I love the Anna Sui brush I got from you, I always forget to use it though because it’s so much shorter than all my other brushes it gets lost in the pot in the middle. When I cleaned my brushes yesterday, I actually pulled it out and left it on the side to get used more frequently. I’ve been waiting for this and I think I am going to get the dupe as an alternative for down the nose, I don’t do it very frequently but it looks nice and precise for the odd occassion where I feel like it! I’ve never seen the ITA brush side on before, I presumed the whole thing was encased in plastic. Seems super lazy for such an expensive brush, and the Duct tape idea sounds terrible given it’s not really protected. If my dogs got hold of that they’d manage to pull the tape off in seconds! That Illamasqua brush you listed looks interesting too, how does that compare size wise to these? Oh yes, this style of brush would be great for shading down the nose. I don’t contour my nose so I didn’t think of that – great point you make! The Illamasqua brush is not as wide side to side if I recall. but it is fatter, and the bristle length is much shorter / blunt. I’ll take a photo of it beside the other brushes when I do my review of the NYX palette! Oh dear, what a rubbishy brush! I only use synthetic brushes now (I could trace one of my sudden angioedema outbursts to a brush with animal bristles), and I’m very happy with them – especially with the cheap ones. No shedding after the first wash, they’re always soft, they remain ‘in shape’, they’re easy to clean with shampoo (fluffy face brushes) or anti-bacterial hand soap (eyeshadow brushes) – and they blend my make-up perfectly. Oh, I never thought about developing an allergy to animal hairs – I guess that does make sense! I have a love / hate relationship with synthetic brushes. For me, they don’t blend powders as well as natural hairs. I think they’re good for liquids and creams but not so much for powders. I currently have 2 key makeup faux pas: badly blended contour (or orange contours) and the black marker eyebrows. UGH. But they look so angry lol! I like how the Anna Sui diffuses the product, making it less subtle or harsh. I can see why you reach for it. Exactly, I like a subtle blush, bronze, and or highlight. Those harsh lines kill me! !